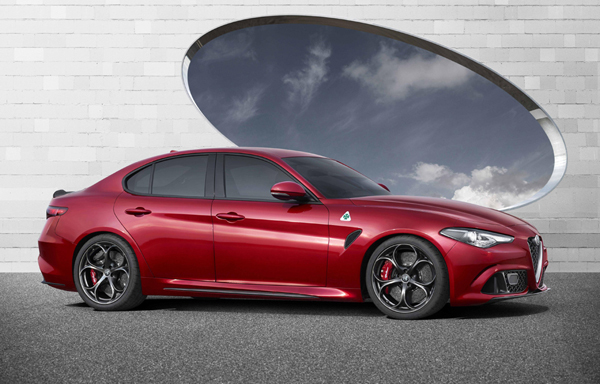 THE all-new Alfa Romeo Giulia Quadrifoglio makes its public debut at the Frankfurt Motor Show (Sept 17–27) with no fewer than five examples of the high-performance saloon on display across Alfa Romeo’s striking and impressive new stand, each finished in a different colour: Competizione Red, Trofeo White, Vulcano Black, Vesuvio Grey and Montecarlo Blue. Built on an all-new, rear-wheel drive platform with an emphasis on light weight and agility, the sporty underpinnings of the new Giulia define its shape and strongly influence its design with Alfa Romeo stylists wrapping the mechanical components in a taut, muscular package dominated by its long bonnet, short overhangs, muscular haunches and the longest wheelbase in its class. Simple, natural lines enhance its shape and proportions, while the surface is finished with elegance and restraint, exuding the purity and style one comes to expect of Italian design. Under the bonnet beats the heart of the Alfa Romeo Giulia Quadrifoglio, an all-aluminium, 2.9-litre turbo petrol V6 engine, inspired by Ferrari technology and expertise, which produces 510hp and 600Nm of torque, resulting in a top speed of 191mph (307 km/h) and a 0 – 62mph (100 km/h) time of just 3.9 seconds. Despite this high levels of performance, the Alfa Romeo Giulia Quadrifoglio also returns best in class CO2 emissions levels at just 198g/km, largely thanks to its electronically-controlled cylinder disabling system and excellent aerodynamics. The front employs a new double wishbone suspension with semi-virtual steering axis that was developed to optimise the filtering effect and guarantee rapid, accurate steering – the quickest steering ratio in its class, in fact. This exclusive Alfa Romeo feature keeps the caster trail constant in corners allowing higher levels of lateral accelerations thanks to its always-perfect footprint. The rear is underpinned by an advanced multi-link set-up, with electronically controlled Torque Vectoring on the rear differential allowing the driver explore the Alfa Romeo Giulia Quadrifoglio’s handling without ever having running up against an invasive stability control system. A new Integrated Brake System (IBS) – an innovative electromechanical system which combines stability control and a traditional servo brake for instantaneous brake response and consequent record-breaking stopping distances – is also being introduced on the new Alfa Romeo, resulting in a stopping distance from 62mph (100km/h) of just 32m. A new Active Aero Splitter, a front aerodynamic aid which actively manages downforce for higher performance and better grip at higher cornering speeds, also debuts on the new Alfa Romeo Giulia. All of the Alfa Romeo Giulia’s state-of-the-art systems are governed by the Chassis Domain Control (CDC), a technology developed jointly with Magneti Marelli which acts like the car’s ‘brains’ and co-ordinates all the on-board electronics. The system manages the action of the various features – Torque Vectoring, Active Aero Splitter, active suspension, brakes, steering and ESC system – according to the mode selected by the driver using the new Alfa DNA Pro. Four driving configurations are available: Dynamic, Natural, Advanced Efficiency (a new energy efficiency mode) and, of course, Race on high performance versions. Underpinning the dynamic capabilities of the new Alfa Romeo Giulia Quadrifoglio are its low kerb weight of just 1,524kg and perfect 50:50 weight distribution which are achieved by using ultralight materials including carbon fibre (prop shaft, bonnet, roof), aluminium (engine, brakes, suspension, front suspension turrets, rear subframe, doors, wings) and aluminium composite and plastic (rear crossmember). Carbon ceramic disc brakes and ultra-light carbon fibre Sparco seats are also available. The same attention to detail has been lavished on the interior of the new Alfa Romeo Giulia, offering the best in terms of quality, safety, equipment and comfort. All the main controls, including the start button, are incorporated in the steering wheel as on a Formula 1 car, while the human-machine interface consists of two simple, user-friendly knobs for adjusting the Alfa DNA Pro selector and the Connect 3D Nav infotainment system. The Connect 3D Nav of Alfa Romeo Giulia – also developed with Magneti Marelli – offers a sophisticated series of features and functions, including a next-generation HMI human-machine interface. The system is mostly controlled by means of the Rotary Pad and viewed using the 8.8-inch TFT display integrated in the dashboard but it can also be controlled via an advanced voice recognition system and a gesture recognition system with which the driver can interact by simply moving their fingers on the Rotary Pad. Connect 3D Nav also allows full connectivity with all mobile devices running Apple iOS and Android operating systems, while the navigation system employs high-resolution 3D TomTom maps and Dead Reckoning technology to compensate for areas with poor GPS reception. Audiophiles will welcome the availability of a sophisticated Harman Kardon Sound Theatre system, which debuts on Alfa Romeo Giulia and uses a 12-channel class D amplifier and Logic 7® technology to distributes rich, clear 5.1 surround sound through high-quality 14 speakers. UK sales of the new Alfa Romeo Giulia Quadrifoglio will begin in the autumn of 2016 with pricing to be announced at a later date. Pricing for left-hand drive markets has been announced at the Frankfurt Motor Show, positioning it in direct competition with key performance car rivals while offer higher levels of performance and more advanced technologies.